View digital images of documents, letters, and telegrams of Koerner and Abraham Lincoln at the following links. In 2014, Donald Allendorf of Columbia, Missouri, an author of several historical books, turned his attention to Gustave Koerner’s career and his relationship with Abraham Lincoln. 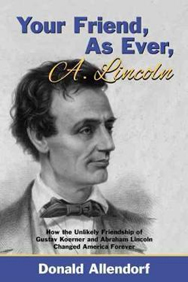 Your Friend as Ever, A. Lincoln, focuses on the political and business relationship the two men shared. 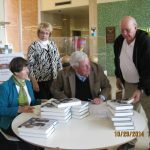 Here Donald and his wife, June, are pictured in the lobby of Belleville City Hall as he signs copies of the book. 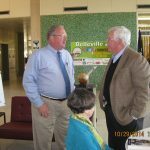 He and Belleville Mayor Mark Eckert enjoyed a conversation about their interests in history. Several thousand documents from the Lincoln Papers in the Library of Congress have been digitized and are online in American Memories, an online collection of historic maps, photos, documents, audio and video materials from the Library of Congress. The online documents are only part of the original collection. Most of the items are General Correspondence from the 1850s through Lincoln’s presidential years, 1860-65.Of the documents online, Gustave Koerner is mentioned in seventy-eight [6/2005]. The Lincoln Papers are characterized by a large number of correspondents, including friends and associates from Lincoln’s Springfield days, well-known political figures and reformers, and local people and organizations writing to their president. When using the search box on the American Memories Web site, be sure to use a variety of spellings for Koerner’s name, as suggested below. A sample of the ‘hits’ returned on the American Memories Web site (not chronological) for Koerner is shown below (search performed June 28, 2005). Use these ‘hits’ as a guide to see specific document images when you perform your own search for Gustave Koerner on theAmerican Memories Web site now. Koerner’s speech before the 1858 Republican Convention appears in Platform der Republikaner von Illinois, niedergelegt in der Republikanischen Staatsconvention, gehalten in Springfield, Illinois, 16 Juni 1858, nebst den Reden der Herren Abraham Lincoln und G. Körner, gehalten während der Convention , (Alton, Ills., Office of the Alton Free Press).The following translation from German is provided by Andrew Gaa, graduate of Southern Illinois University Edwardsville. Mr. Gaa is currently (2006) working towards a masters in German/Secondary Education at SIUE. He studied at Ruprecht-Karls Universitaet in Heidelberg, Germany, and teaches German at Mehlville High School in South St. Louis County. My gentlemen! I sincerely thank the convention for the great honor, through which you have shown me great respect, that you have elected me chairman (of this convention). It is an honor to preside over a convention, that is so respectable as this one, respectable in reference to the talent, knowledge, and character, which are so important to the great and noble principles, which we have defended for so many years, and hopefully we will be victorious in the upcoming struggle. Because this honor was not anticipated, I am not prepared to hold a speech at the opening of this convention, and it is also not to be expected. I congratulate our party for the glorious prospects which we have. Presently thousands upon thousands are fighting with us, who earlier opposed us. They have become discontent in their beliefs, and the deception of the apparent Squatter Sovereignty is raging as far as the territories it effects. I believe, it must be conceded, in our and other northern states, in which we were not very successful in 1856, that we lost the battle as a consequence of the fraud and deceit of this pretentious doctrine. But I believe that after this doctrine was declared by their great leader Mr. Buchanan and after the highest court gave this great deceit of the century the sedative for eternity, thousands and thousands who before opposed us are now with us. How was the administration of Buchanan successful? Did it keep its own promises? Did it make Kansas a free state? My Gentlemen! Did it not do everything it could in its power to make Kansas a slave state? What does Mr. Buchanan say in his delegation? I have no time now to go over this issue, but he says to you, the land is in a disastrous state, a disastrous state, which comes from the faulty bank system and the downfall of almost all banks in the land. He gave the people of this land a speech about the disadvantages of banks and of the suspension and so on, and said a bankruptcy law should be enacted in order to remedy all of this evil. Now good, the banks have suspended and special payments have begun again, but the government has suspended. No more paper money should exist. But what does Buchanan do? The first was to give out $15,000,000 in paper money. A reform in the finances should take place. At the time there was not more than $25,000,000 in the reserve, but what is there now? We now have a $25,000,000 debt. What has become of the bankruptcy law? My gentlemen. I believe Mr. Buchanan never thought about passing such a law. Furthermore, the filibusters have to be kept secret, yes, private filibusters. Lecompton had to be passed; it did not pass the way Buchanan had wished.Where is the wise administration of James Buchanan now? These are only several of the results of the administration of the great statesman, the great statesman of 30 years of public life. The administration of James Buchanan is very abnormal and a disgrace. Compare the administration of Mr. Tyler with that of Buchanan, you will find the former more honorable that the latter. What type of people are they, who have maintained the administration of James Buchanan, whose aim and effort it is to subject a nation to violence? We should have spoken out against them, against what they have done, against these office hunters and idlers. So far as a part of the democracy works with us, we promise this our binding attention ; however they do not need to complain when we pass the poison cup to their own lips. We sympathize with our well known Senator and his friends in their present position. Whenever they want to join our ranks and work with us, we will welcome them. However we were independent from these 92 votes against the disgraceful Lecompton Constitution, which does not refer to Kansas, however goes much further. It is this question, which keeps our soil free. An attempt was made through this Lecompton story, not only to trample the rights of the people, however also to trample the basic principles of American freedom. Never before has such a horrible attempt in the history of any administration been surpassed, with the exception of the English Bill, the most disgraceful law (Massregeln), that has ever been produced. It immediately makes a man who votes for slavery two, while only one for a man who votes for freedom. But this Law will not and can not be successful. The people have willingly announced their intentions- what it will have to do with this question, and because one now sees clearly through it, thousands will unite with us now, in order to bring this agitation to an end. The party, which names itself the Douglas Party has no strength and no goal, except to elect a United States senator. Should Douglas die tomorrow, so would all turn to the republican party. So I say, our principles must triumph, and allow me to say, that much is dependent upon this convention. If the negotiations of this convention distinguish themselves through the principles of freedom, we will be, with certainty, as glorious in the coming election campaign as we are gathered here today. Yes, we will be victorious with a large majority and the state of Illinois will be free forever. The Mr. Lincoln and Friends Web site is produced by The Lincoln Institute under a grant from The Lehrman Institute. when you arrive on the Lincoln and Friends home page, click on Koerner’s image (The Politicians) to read an overview of men with whom Lincoln associated and the political times. Subsequently click on Koerner’s image for a biography of this active man. Snyder was admitted to the bar in 1820 and practiced at Cahokia before moving to Belleville in 1833. He took Gustave Koerner as a law partner and introduced Koerner to Democrat politics. Snyder served a term in Congress and was the Democrat candidate for Illinois Governor at the time of his death in 1842. Snyder’s fashionable home at North First and West “A” was demolished in 1917 to make room for a new post office. In 1833, Gustave Koerner had a German law degree, but unfamiliar with American law and the English language, he decided to take law courses at Transylvania University in Louisville, Kentucky. He met Mary Todd while mixing in the Louisville social scene, a friendship that would be renewed in later years when Mary married Abraham Lincoln. Koerner’s early legal career required riding the courthouse circuit to earn a living. Koerner described his winter visits to the Kaskaskia courthouse: “a mere barn, with some window panes missing. Judge Breese would sit on the bench in his great coat with a handkerchief tied around his head.” Due to a lack of accommodations at each stop on the circuit, Koerner said he shared a bed with the judge and prosecuting attorney and they slept “spoon like.” Sidney Breese would later serve in the U S Senate and work to establish railroads in Illinois. Trumbull practiced law in Belleville with his brother. Koerner and Trumbull attacked the last vestige of slavery in Illinois, the indentured servant act, by taking the case of Sarah Borders who fled her Sparta, Illinois owner to move to Peoria. The Illinois Supreme Court ruled against her, but Trumbull resolved the issue a few years later in a St. Clair County case, Jarrot versus Jarrot. Hecker was one of the prominent “48ers,” revolutionaries of 1848 who fled to the U S after a failed coup in Germany. He was recognized in his homeland as a champion of human rights and virulently anti-clerical. Hecker purchased a farm near Lebanon and became active in Democrat, and later, Republican politics. Lincoln asked Koerner to have Hecker speak at a German gathering to support his 1858 Senate campaign against Stephen Douglas. Koerner urged caution in employing Hecker’s fiery oratory skills, adding, “while well calculated to animate friends, he cannot conciliate opponents, and amongst Catholics and even orthodox Protestants he is considered as the very Anti-Christ.” Germans memorialized Hecker with monuments in parks at St. Louis and Cincinnati. Bissell joined James Shields in a Belleville law practice in the 1840’s. He served in the Mexican War at Buena Vista and when Jefferson Davis, later the president of the Confederacy, made critical remarks of Illinois soldiers service that day, Bissell defended his men, which prompted Davis to issue a challenge to duel. Davis’ father in law, President Zachary Taylor, who was Bissell’s commander at Buena Vista, had Davis arrested to stop the duel. As Lt. Governor in 1853, Koerner was in line to become Governor. Know Nothings in the Illinois legislature would not support Koerner, and Bissell was chosen as the candidate. Lincoln visited Belleville in October 1856 to support John Fremont for president and Bissell for Governor of Illinois. Bissell was the first Republican elected Governor. As a member of the statewide Democrat ticket, Koerner supported Douglas prior to introduction of the Kansas Nebraska Act which would have allowed expansion of slavery to western states. Koerner thought Douglas’ introduction of the Act was aimed at gaining southern votes in a later bid for president. Koerner worked tirelessly for Lincoln in the 1858 Senate race against Douglas, sitting with Lincoln on the platform at the last debate in Alton. Koerner and Douglas reconciled by the time of Lincoln’s presidential inauguration, noting in his Memoirs, he lent Douglas a shawl on the chilly morning of the swearing-in. Koerner and other Lincoln supporters fought to get Chicago as the site of the Republican convention for the 1860 presidential race. Lincoln’s supporters negotiated with state delegates to wrest the nomination from the pre-convention favorite candidate, William Seward. Koerner was the only southern Illinois leader to serve as a pallbearer at Lincoln’s funeral. Koerner’s importance as a key supporter in the German community, Lincoln’s appointment of Koerner as Minister to Spain in 1862 and his early friendship with Mary Todd in Louisville placed him among Lincoln’s closest advisers.